We welcome visitors to our preschool where children learn in English and French. Our Summer Camps are officially open with easy enrollment for all children. “Summer Tots Camp” is tailored for children of age 2 and the “Merry-Go-Round” Camp is designed for children ages 3-5. 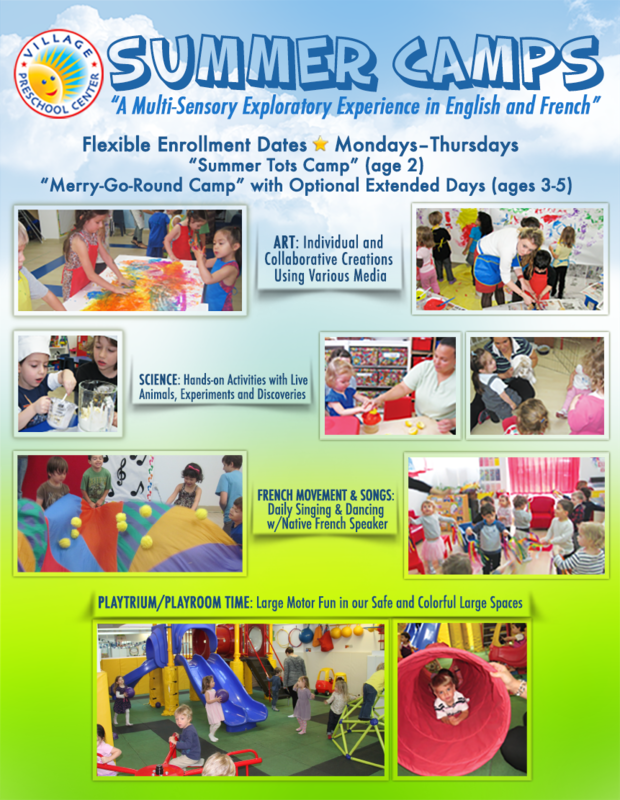 Your little camper (and their friends) will have the time of their lives with our “Multi-Sensory Exploratory Experience” facilitated in both English and French. Our camps are filled with: Art, Science, Music/Movement and the Surprise Centers. The children are always thrilled with new discoveries, large-scale building projects, learning and creating collaboratively/independently and so much more! Enrollment is quick and easy. Simply bring the listed forms filled out to our front desk. You may reach us from 8:30am-4:00pm, Monday-Friday at 212-645-1238 for additional questions.